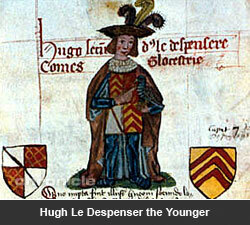 In 1317, Hugh le Despenser the younger inherited the lordship of Glamorgan and a portion of the de Clare's South Wales estates through his marriage to Eleanor de Clare, eldest daughter of Gilbert de Clare 'the Red'. As chamberlain at the court of Edward II, and favourite of the king, Hugh was able to influence the feeble-minded ruler, becoming one of the most powerful and hated men in the country. In July of 1317, Despenser claimed that his brother-in-law, Hugh D'Audley, husband of Margaret de Clare was withholding his share of the Welsh estates from him. Not wishing to wage war, D'Audley swapped his Welsh estates for lands in England. Despenser next exerted similar pressure on Roger Demory, husband of Elizabeth de Clare. He later had both brothers-in-law falsely charged and convicted at Gloucester in order to secure the confiscation of the rest of their lands to the Crown and next obtained a grant of full sovereignty from the king. This meant that he could hold the lordship by the same privileges as the past Lords of Glamorgan. Although all Hugh’s predecessors had been known as ‘Earl of Gloucester and Hertford,’ Hugh became the first to describe himself as ‘Lord of Glamorgan.’ As soon as he had been installed in this position of authority, Hugh ousted the Welsh from offices that they had held for three generations of de Clares, instead appointing men like Bartholemew de Bradlesmere and Payn de Turberville. The ancestral territory of Welsh rebel Llewelyn Bren was to be ruled over by William de Berkerolles. Following this, Hugh asked King Edward II to return the imprisoned Llewelyn to Glamorgan. In 1318, he was tried, convicted and executed as a traitor by Sir Will Fleming. Both of these moves incensed the Welsh. By August 1318, the Church and Baronage had become increasingly worried about the way the powerful Hugh Despenser controlled the weak-willed king. In an effort to reduce Despenser's influence, they appointed an advisory body which Edward was obliged to consult on all matters not involving Parliament. However, these measures failed to remedy the situation and the disaffection of the barons continued to grow. Early in 1321, the king ordered them not to hold assemblies or musters in their lordships because he had heard about their activity in the Marches and feared for his position. The leaders of the Marcher opposition were summoned to meet the king in council at Gloucester on the 5th of April, but refused to attend. By the following month, the barons, lead by Hugh D'Audley and Roger Demory, petitioned the king to dismiss Despenser, blaming him for the murder of Llewelyn Bren. When the king refused, the barons took the law into their own hands, gathering 800 men-at-arms and 10,000 footmen and undertaking the 'ten days raid of Glamorgan', which they devastated from end to end. Although Despenser was forewarned, he was powerless to resist the combined power of the barons and the Welsh, led by Rhys ap Llewelyn Bren. In August 1321, the barons forced Parliament to banish Despenser. The king was helpless in the face of the display of force and so the Assembly exiled the elder and younger Despensers and deprived them of their lands. However, the king and his army defeated the rebel barons at the battle of Boughbridge in Yorkshire, ensuring that the Despensers had returned by March of 1322. By May 2 nd, Hugh had been restored to his former power at Parliament in York. On September 24th, 1326, Queen Isabella landed in East Anglia alongside the remaining rebel barons and their Flemish and German Mercenary forces. When the king realised the strength of the forces against him, he fled with Hugh Despenser the younger and others. Despenser and the king sought refuge at Caerphilly castle, putting it into a state of defence and building up provisions. Meanwhile, the queen established her headquarters in Hereford, laying a price on the head of Despenser in his own lordship. On 16 November 1326, Despenser, his son and the King were captured in a wood near Llantrisant. Despenser was taken to Hereford and forced to wear Gilbert de Clare’s coat of arms to signify that he owed every greatness to his wife and was nothing in himself. He was charged with years of high crimes and misdemeanours and sentenced to death. Hugh le Despenser the younger was drawn then hung from an iron fork on gallows fifty feet high. His head was secured between the prongs of the fork and he was then jerked up and down with his whole weight resting on the prongs until he was dead. He was next beheaded and quartered and his bowels thrown into a fire.